In the App Store, there are a multitude of to-do lists, but Things proves to be in the top of the pack. Things for iPad takes advantage of the screen real estate as well as providing a hybrid interface of Things for iPhone and Things for Mac. An elegant interface, simple and powerful. Things for iPad enables the user to add new to-do items, set a due date, and add notes to your to-do items. Additionally, Things allows adding to-do items into projects, such as personal items or a grocery list. After completion of an to-do, check the to-do off and one item fewer to completion. Things for iPad not only has Today section, but also sports a Next and Someday section. We as well as the programmers at Cultured Code understand we are limited to an amount of to-dos and the Someday section is perfect for slow days. Not only is Things for iPad works well alone, Things for iPad syncs well with Things. Staying in sync with the two versions work seamlessly. While over Wi-Fi and paired, Things takes its course and keeps both version of Things in sync. Things does all the behind the scenes work, so users can be more concentrated on items at hand. I know my version of Things would not be sync if Things did not automatically sync. I believe that Things for iPad, proves to be the best. 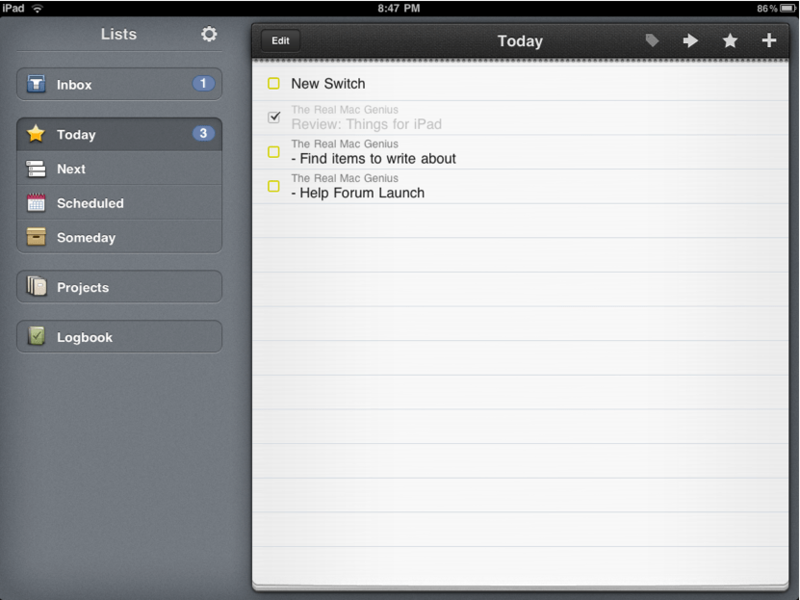 Things for iPad’s simplicity may be one of the best advantages over other to-do list applications. Other to-do applications are too complicated, so I waste time instead of getting organized. I recommend Things for iPad for anyone who owns an iPad and looking forward to getting organized. Though it may not fair the same price lower price of the iPhone version, if you are willing to spend the money, get Things! P.S. One fewer item on my to-do list.